The RP Photonics Buyer's Guide contains 54 suppliers for spectrometers. An optical spectrometer may be an instrument which can spatially separate spectral components of light, so that they can be separately processed further. A spectrometer often also contains some photodetector(s) for analyzing the light. The instrument can then be used for recording the optical spectrum of a light source. Such analyzing devices are more specifically called spectroradiometers or spectrographs. Other spectrometers are made for analyzing substances or objects in terms of spectroscopic properties, for example wavelength-dependent transmittance or reflectance. They are more specifically called spectrophotometers. This article focuses on spectrometers for spectrally analyzing light; see the article on spectrophotometers when the analysis of substances or objects is of interest. Measurements with spectrometers typically deliver the optical power spectral density (PSD) as a function of the wavelength or optical frequency. Not all spectrometers deliver calibrated PSDs; often, the intensity readings are uncalibrated, possibly with a substantial wavelength dependence of the (unknown) calibration factor (responsivity). There are also methods of spectral interferometry, which can measure not only the power spectral density but also the spectral phase. Many spectrometers exploit the wavelength-dependent diffraction on one or several diffraction gratings, or the wavelength-dependent refraction at one or several prisms. Typically, an incident light beam is collimated (made parallel) before being sent to a grating or prism. After that dispersive element, different wavelength components propagate in slightly different directions. The light may then go through some additional optics and finally get to a photodetector. For obtaining a spectrograph (a non-scanning spectrometer), the photodetector may be a photodiode array, CCD array or similar, recording optical intensities over some spatial range, which correspond to a certain spectral range. One does directly obtain an optical spectrum by mapping the detector pixels to optical wavelengths. The data acquisition is then relatively fast, because all wavelength components can be measured simultaneously. The resolution is then typically limited by the density of detector pixels, or possibly by the optical setup. Spectral peak positions may be determined with an accuracy better than the pixel resolution by using interpellation. In a scanning spectrometer, the detector can be a single photodiode or a photomultiplier, placed after a narrow slit, so that only one narrow range of wavelengths can get to the detector at one time. The slit position or the angular orientation of the grating or prism may then be moved such that a certain wavelength range can be scanned, assuming that the PSD of the input light remains constant during that time. The optical setup then functions as a tunable monochromator. Figure 1 shows the common design of the Czerny–Turner monochromator. The acquisition time for a full spectrum can be long if a wide spectral range is scanned with high resolution and if the detector cannot be very fast, e.g. because the low optical power enforces a substantial average time. Long acquisition times may not only be inconvenient, but a real problem if the properties of the light source are not constant. Figure 1: Design of a Czerny–Turner monochromator as used in scanning spectrometers, and without the exit slit (or a broader slit) for non-scanning devices. Light passing the entrance slit is collimated with a curved mirror, experiences a wavelength-dependent deflection at the diffraction grating and is then focused again with another curved mirror. For one orientation of the diffraction grating, only light in a narrow wavelength band can pass the exit slit. (The shown rays apply for a wavelength in that range.) The whole setup is placed in a box, containing additional apertures and black shields in order to minimize effects of stray light. Some grating spectrometers are extremely compact, with a width of only a few centimeters. However, the highest performance – in particular in terms of resolution and sensitivity – is obtained with much larger instruments. Typical wavelength resolutions reached with such spectrometers are about 0.01 nm to 0.1 nm. The input light often has to be sent onto an entrance slit of variable width. For highest spectral resolution, the slit should be made narrow, but that reduces the transmitted power and may therefore lead to increased noise or longer acquisition times, particularly for optical sources with low brightness. Some spectrometers have a fiber input, either with multimode fiber or single-mode fiber. Multimode fibers make it easier to collect light, while single-mode fibers allow for highest spectrometer performance. Diffraction gratings are often used with the first diffraction order, but sometimes with higher diffraction orders in order to obtain a better spectral resolution. In any case, there can be problems with artifacts related to light being diffracted on other orders. If one finds spectral features which are hard to explain, one may check whether they could be such artifacts. The response of a spectrometer may depend on the polarization, because the diffraction efficiency of a grating or the reflection loss on a prism arrangement is polarization-dependent. Some spectrometers have to be calibrated by the user. For wavelength calibration, one may use certain discharge lamps, emitting line spectra with precisely defined wavelength components. Calibration of the responsivity for the whole wavelength range is often more difficult. One possibility is to use an incandescent lamp with a known filament temperature or calibrated optical spectrum. Some instruments are based on a Fabry–Pérot interferometer, where the mirror spacing is mechanically scanned, e.g. via a piezo actuator, while the transmitted optical power is registered. The usable spectral range is the so-called free spectral range, determined by the mirror distance; this is typically of the order of 0.1 GHz to 10 GHz, i.e., very small in terms of nanometers. The resolution bandwidth is the free spectral range divided by the finesse, the latter being determined essentially by the mirror reflectivities. A large distances between the mirrors allows for a higher resolutions, but also leads to a narrow free spectral range. Fourier-transform spectrometers can contain a Michelson interferometer, where one arm length can be mechanically scanned over a long range (millimeters, centimeters or even more). The detector signal versus time, recorded during a full arm length scan, has to be Fourier-transformed to obtain the optical spectrum. 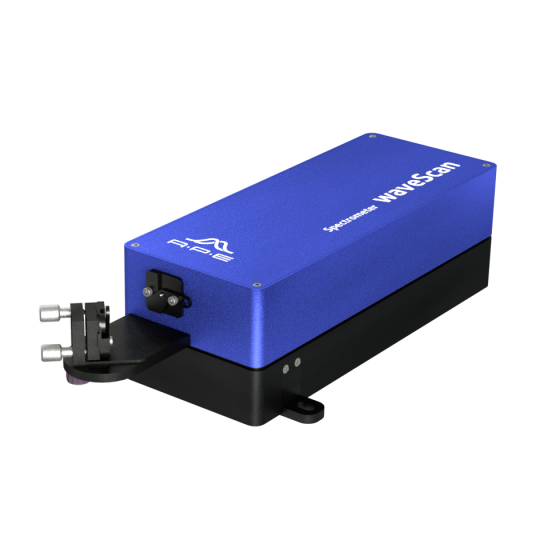 A simplified version is the wavemeter, specialized on precisely measuring only the wavelength of a laser source, rather than recording full optical spectra. Arrayed waveguide gratings are sometimes used for very compact spectrometers. They are based on interference effects in a small waveguide device. A totally different principle of operation can be realized for the spectral analysis of broadband ultrashort pulses. One may simply send such pulses through a long optical fiber, which introduces substantial chromatic dispersion. The latter then results in substantially different arrival times of different spectral components after the fiber: a pulse with an original pulse duration of far below 100 fs may then be spread over several nanoseconds, for example. By analyzing that light with a fast photodiode and oscilloscope, for example, one can obtain information on the optical spectrum. Of course, one should make sure that optical nonlinearities are not invalidating the results; in fibers, this strongly limits the allowable peak power. A very attractive property of that method is the high speed with which an optical spectrum can be recorded. A single ultrashort pulse is sufficient for that purpose, whereas a conventional scanning spectrometer, for example, may require many seconds for that and would average the spectrum over many pulses of a pulse train. Traditional spectrometers work in the visible spectral range, with infrared light or possibly with ultraviolet light. However, there are also spectrometers for operation in extreme spectral regions such as the extreme ultraviolet (EUV) or even the X-ray region, with wavelengths of only a few nanometers. Such devices may be based on diffraction gratings with very small line spacings, or in the X-ray region even on single crystals, exploiting the periodicity on the atomic scale. As photodetectors, one may use special X-ray CCD cameras or multichannel plate (MCP) detectors (→ photomultipliers). If only the spectral linewidth of a laser beam needs to be measured, but not the detailed spectral shape, one can use other methods, e.g. perform a self-heterodyne linewidth measurement. With such methods, one can measure very small linewidths which are far below the typical resolution of a spectrometer.